STURBRIDGE, Mass. (Nov. 17, 2011): Visitors to Old Sturbridge Village’s Christmas by Candlelight celebrations can experience the sights and sounds of a traditional holiday as they stroll the magical candlelit 19th-century village, enjoy a horse-drawn sleigh ride, meet Father Christmas and Santa Claus, and hear Victorian holiday carolers. 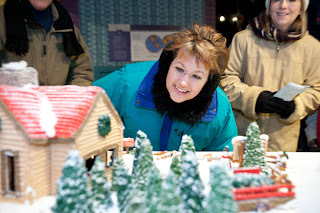 OSV historians will show the origins of favorite holiday traditions like roasted chestnuts, Christmas trees, Yule logs, gingerbread houses, and sugar plums. Now in its ninth year, Christmas by Candlelight will take place from 4:00 – 900 p.m. on Friday, Saturday, and Sunday evenings Dec. 2-4, 11-13, and 16-18. For details:www.osv.org or 508-347-3362. Tickets purchased now through November 20 will be discounted up to 50%. Old Sturbridge Village’s “Christmas by Candlelight” allows visitors to escape the frenzy of the modern Christmas season, enjoy the old-fashioned spirit of the holidays and learn how today’s favorite traditions originated. 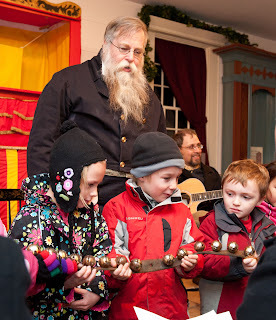 At Christmas by Candlelight, visitors can actually see “chestnuts roasting on an open fire,” hear why they were a favored treat in early New England, and also learn the origins of candy canes, mistletoe, and how poinsettias were introduced to this country. Visitors can vote for their favorite entry in the annual OSV Gingerbread House Contest and take part in a rousing Christmas carol sing-a-long, and learn a dance from Charles Dickens’ A Christmas Carol. Hands-on activities include making a Christmas keepsake while learning about the history of Christmas cards, and making a tin ornament while finding out the history of Christmas tree decorations. Visitors of all ages are invited to tell Santa Claus what is on their holiday wish list. Live performances include Punch and Judy puppet shows, Victorian carolers, five different holiday-themed readings, including ‘Twas the Night Before Christmas, Rudolf the Red Nosed Reindeer, How the Grinch Stole Christmas, and nativity stories, and on select evenings Bob Olson’s Holiday Magic and Andrea Caspari’s shadow puppet theater. A model train display is new this year, and other Christmas by Candlelight exhibits include an extensive nativity set with hundreds of pieces and a miniature New England village. Musical performers include a wide range of professional, student, and community musicians, including Full Gael Celtic Christmas, Worcester Men of Song, Quintebrass, Boston Jazz Voices, and the Old Sturbridge Village Singers. Three different hand bell choirs will be featured: the Merrimack Valley Ringers, Elm Street Handbells, and the Tantasqua Faculty Handbell Choir. Student musicians from Worcester State University and a number of area high schools will also perform. A current schedule is listed below, but for the most up to date information, go to www.osv.org. The museum gift shop and Oliver Wight Tavern will be open for holiday shopping and dining during Christmas by Candlelight, which is sponsored by Fallon Community Health Plan, Savers Bank, and Bollus Lynch. In order to focus on the evening holiday events, Old Sturbridge Village will be closed during the day from November 28 – December 25. The Village will be open for Christmas by Candlelight on Friday, Saturday, and Sunday evenings from 4:00 – 9:00 pm. Dec. 2-4; Dec.11-13, and Dec. 16-18. The Village will return to a daytime schedule for its popular school vacation week activities Dec. 26 – Jan. 1. Old Sturbridge Village celebrates life in early New England from 1790 – 1840. Located just off the Massachusetts Turnpike and Routes I-84 and 20 in Sturbridge, Mass., OSV is open year-round, but days and hours vary seasonally. For details, visit www.osv.org or call 800-SEE-1830.